in the heart of Greenwich Village. 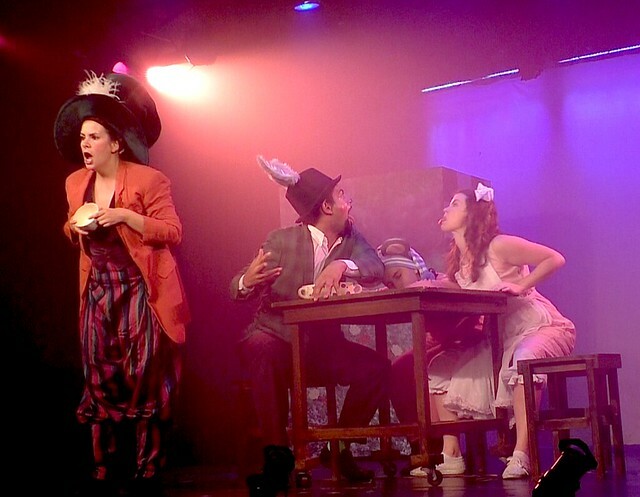 Tumble down the rabbit hole with the wonderfully, wild, wacky and whimsical cast of characters in the new musical and world premiere of ALICE in Wonderland by Michael Sgouros and Brenda Bell. Frolic with Alice as she dances her way through Lewis Carroll's legendary tale. Meet the White rabbit - if you can catch him! Don't forget to bow to the Queen of Hearts or she'll chop off your head - oh my! 60 minutes of marvelous mayhem. It's sure to be a mad tea party and you're the guest of honor! In addition to the one hour musical, the audience receives a special treat - interactive arts workshop prior to the performance. Here the audience learns about the original book and how we turned it into a musical. We discuss the themes of the show and how the arts bring literature to life. Then the kids and their families make a special art project and take it home as a souvenir. Now when they watch the show, they are familiar with the art forms and themes represented in the production.